We found this reef by accident, using the boat depth sounder. We were looking for Bare Island isolated reefs, identified by Michael McFadyen. It appears after consultation with Michael that Anchor reef is actually one of the Bare Island Isolated Reefs described by him. We had intended to dive outside the heads but the seas were too rough. Anchor reef sits about 330m south west of Bare Island. It is 220m from the end of the most commonly dived Bare Island West reef, which we are very familiar with. We have been able to determine exact GPS co-ordinates for this point by using the depth sounder and then diving down with a weight and float to verify the location. We doubt that many divers, without the aid of a scooter would be able to get out to anchor reef from the shore, or if they do they would have very limited time to explore it. Divers rarely dive Bare Island or it's surroundings from a boat so it is unlikely that many divers have been here before us. This reef is quite remarkable. Lying East-West in 18m on the sand, it is about 80m long and 20-30m wide. It took us about 30 mins to circumnavigate it. 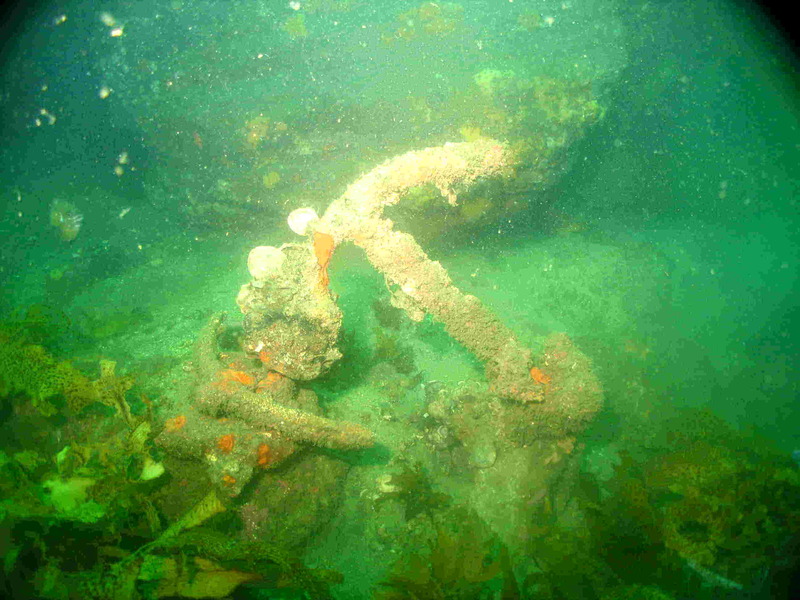 It boasts a number of anchors, lots of very old rope and some really interesting timbers that we have yet to identify. Sea pens live in the sand, along with a few stingarees. Around the reef are a number of resident weedy sea dragons. There are beautiful sponges and corals of various colours. We have seen cuttle fish eggs here. There are plenty of PJ eggs and we have found a juvenile PJ here. Fish life abound and there is little current. Visibility has not been the best at 5-8m, but once you are on the reef this is plenty as there is so much to see. The reef also has many small cracks and gullies which we are yet to explore. The top of the reef is at about 14 metres. To the North and East are other reefs. We have only explored 2 of them but can see more shadowy in the distance. It is possible that there is a string of reefs, separated by sand that run from Anchor reef across to the isolated reefs. We might be able to verify this one day. There does not appear to be any reefs further south but we haven't explored far enough out to be sure of this. We will dive this reef many times and will be producing a map of it. But if you do dive at Anchor reef - leave your name on the slate that we will have there. First dive on Anchor reef was October 15, 2005. We did a further dive on it on October 22, 2005 and then 2 dives on October 29, 2005. The last of these 3 dives was a decompression dive. We spent 15 mins @ 5m after 45 mins on the reef. Click on the links below to go to individual dives on Anchor reef. Most have photos.